I have to say I'm not really impressed with this months BirchBox. If this were my first month, I don't know that I'd want to keep getting the subscription. I actually just bought my best friend a 12 month subscription for BirchBox as well and I'm really hoping that this isn't her first box. Maybe the June box just left me spoiled. Another Juicy Couture fragrance sample. Not really excited for it, since I did get a Juicy fragrance sample last month. The scent is alright, sweeter than I typically like. I actually love leave in conditioners. I'm a beach bum and so I often need them. I was excited about this product, but I can't stand the fragrance. When first applied it smells very much like perfume, and then it settles into a sort of musky smell. Not a fan. Won't be using this. This product I love. An all over cleanser with just the right amount of mint. Don't start thinking spearmint scent or even over the top minty stuff it's a natural mint smell and it works amazing as a face cleanser. This applies pretty heavy and thick like a sunscreen. My sample came in a medium pigment which appeared to be dark, but after applying the color did match my skin. The CC cream takes sometime to dry so if you're like me and tend to touch your face this product is probably not going to work for you. I feel like this product is pretty much a pigmented sunscreen and I don't think I'd use it. Yea, they are thick bobby pins with a pattern on them. I may or may not use them...but I'm not real trilled about them either. There you have it. 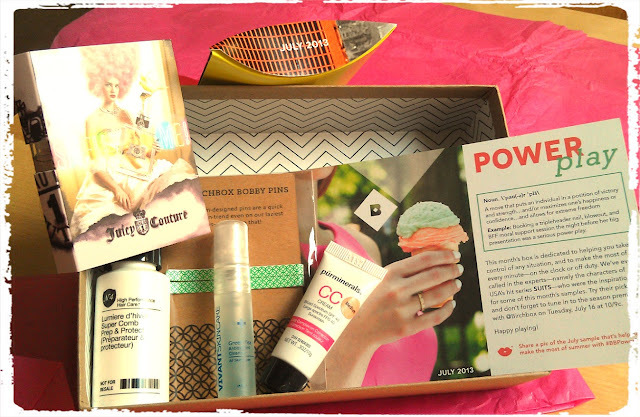 That's the July 2013 BirchBox. If you want to sign up feel free to use my referral link. This post contains referral links, but I pay for this subscription and I didn't get anything for free. I have thought about subscribing to Birchbox. Still not sure, thank you for posting. Until this box I've felt like it's been a great inexpensive subscription. This month didn't blow my mind. This is a neat idea though.. Getting monthly surprises is fun. Wish they had options to subscribe abroad. Interesting idea. I love getting things in the mail so i would love this! I see these around here and there, and I like the concept. Sorry yours wasn't stellar this month though. I have always wondered about subscribing to these things. It sounds great but I have always been afraid that I would always get stuff I didn't like. For the most part I'll use the stuff that comes. I find that I'm usually pleasantly surprised and I get to try out products I might not have heard of. For $10 a month it's pretty worth it. Interesting what is the most interesting item you received so far? Interesting idea - I have never heard of it before.